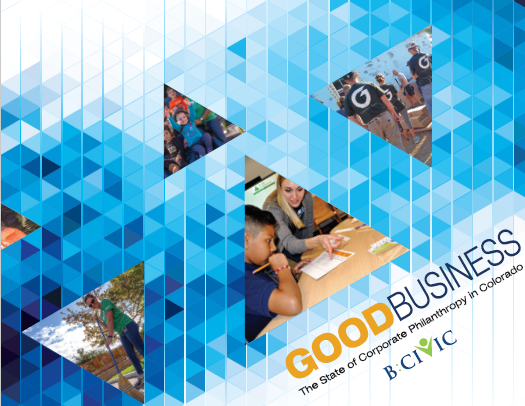 The GoodBusiness report was created through the collaboration of B:CIVIC, TIAA, DaVita, The Denver Metro Chamber and the University of Denver. Research was conducted through an on-line survey in the fall of 2017 with businesses in and around the Metro Denver area by Corona Insights. On the cover: Pinnacol Assurance, TIAA, and Guaranty Bank and Trust. On the back cover: Pinnacol Assurance, Xcel Energy and MillerCoors. Design by Rock Solid Design. Printing by YellowDog Printing & Graphics. A Billion + Change Founded in 2008, A Billion + Change has mobilized hundreds of companies—from the largest in the Fortune 100 to the smallest sole proprietorship—to give back to their communities through pro bono service. B:CIVIC B:CIVIC, a partner of Denver Metro Chamber Leadership Foundation promotes and advances corporate social responsibility for the betterment of all communities and businesses. B:Lab B:Lab is building a global community of Certified B CorporationsTM who meet the highest standards of verified, overall social and environmental performance, public transparency, and legal accountability. CECP – Giving In Numbers Report Founded in 1999, the organization represents more than 200 of the world’s largest corporations. Their annual Giving In Numbers study provides an in-depth analysis of giving and engagement data. Colorado Nonprofit Association The Colorado Nonprofit Association advocates for nonprofits serving as the collective voice for the sector. Community Foundations Community Foundations are grantmaking public charities that bring together financial resources of individuals, families and businesses to support effective nonprofits in their communities. Community Shares of Colorado Community Shares of Colorado offers workplace giving programs, toolkits and services with hundreds of companies and nonprofits. Cone Communications Cone Communications is a national agency with three decades of leadership in corporate social responsibility for clients across the nation. Their Insights research is known as national sources of trends in this arena. DaVita DaVita Kidney Care is a leading provider of kidney care in the United States, delivering dialysis services to patients with chronic kidney failure and end stage renal disease. Denver Metro Chamber Leadership Foundation The Denver Metro Chamber Leadership Foundation has built strong, diverse leaders for more than 40 years. The values that guide them are Colorado’s Civic DNA™, and they pass them on in everything they do. Points of Light – The Civic 50 Begun in 1989 by founder President George H.W. Bush, Points of Light is a national organization for volunteering. Their Civic 50 recognizes the 50 most community-minded companies annually who earn $1B or more in revenue. Social Venture Partners As an international program with a chapter in Denver, SVP is a philanthropic networks that brings together donors, nonprofits and social enterprises. Spark the Change Colorado (Formerly Metro Volunteers) Spark the Change Colorado offers volunteerism tools, connections, matching services, coordination and training’s. Tap Root Foundation The Taproot Foundation connects nonprofits and social change organizations with passionate, skilled volunteers who share their expertise pro bono. TIAA TIAA is the leading provider of financial services in the academic, research, medical, cultural and government fields. TIAA has $1 trillion in assets under management (as of 12/31/2017) and offers a wide range of financial solutions, including investing, banking, advice and education, and retirement services. University of Colorado Leeds School of Business The Center for Education on Social Responsibility (CESR) offers three certificates in specialized areas of corporate social responsibility and social entrepreneurship including one in partnership with B:CIVIC. Barton Institute for Philanthropy and Social Enterprise The Institute is interdisciplinary, bringing together resources from the university and the community to address major social issues. At the Barton Institute, they believe that such issues can only be addressed when the public, private, and nonprofit sectors come together. Institute of Enterprise Ethics The Institute for Enterprise Ethics is dedicated to the integration of ethical, socially responsible, and environmentally sustainable leadership practices into the fabric of corporate culture through collaboration among its faculty and business partners in creating and sharing knowledge needed to achieve that goal. United Way Organizations United Way improves lives by mobilizing the caring power of communities around the world to advance the common good.